Here at Schreiner's Iris Gardens, we take as much care with our Customer Service as we do with breeding and growing the very best Iris. One of our prized collections in the office is the file of correspondence received over the years. Below you'll find emails from several recent customers. 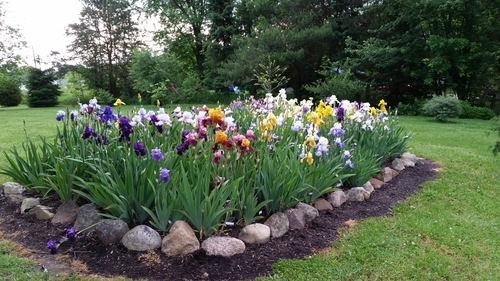 We invite you to share your experience growing Schreiner's Iris. To share your experience, please click the "Submit a Testimonial" button. Thank you and Happy Gardening! 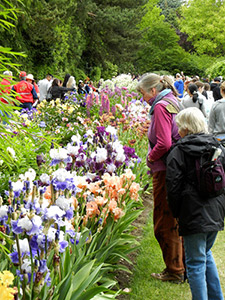 Read more reviews about Schreiner's Iris Gardens from visitors and customers at Trip Advisor. All reviews and images submitted through this Feedback Form will be previewed for legitimacy and appropriateness. We reserve the right to not post any material we believe to be offensive or otherwise inappropriate. Thank you for your understanding. You are always welcome to phone us if you have concerns with or questions about our plants, products or customer service, so that we may have the opportunity to address the issue and take necessary actions to remedy your concerns. Our toll-free number is 800-525-2367. After getting my new beds ready, I ordered 42 varieties of Iris from Schreiner's. Words are not enough to express how beautiful the blooms are. I have purple colors that are 8 inches large with 5 large blooms per stem. Amazing to see! My husband and I go out each morning to see what is new in the garden. Yesterday, I ordered 15 more varieties. I am putting in another new bed. I plan to paint each Iris in a series of oil paintings. I will share a painting with you next. Again, thank you Schreiner's for huge, beautiful flowers. Our best to all of you there. I bought 16 different Bearded Irises 2 of each and planted them today. I can't wait till next spring. I am delighted with the iris "Dancing In Pink." In spite of my sometimes haphazard, faulty gardening practices, my "Dancing in Pink" plant produced three tall stalks covered with big, gorgeous, lacy, ruffled blooms which lasted long enough for me to do a painting of them. I passionately love the hundreds of iris that I have bought from Schreiner's Iris over the decades. I'm so obsessed with buying iris that I sometimes have planted them where they received inadequate sunlight, or a little too near roses so that high-nitrogen rose fertilizer probably flowed downhill toward them, or they are left for some time with weeds crowding around them, or I fail to water or fertilize them adequately or correctly. 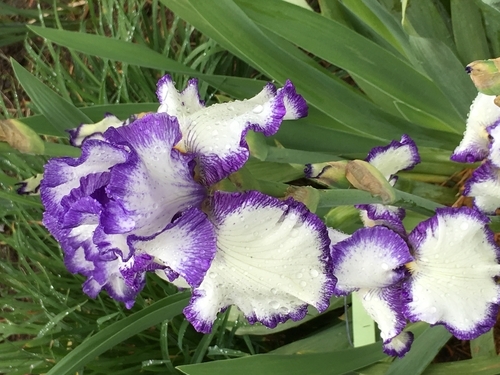 A very large number of irises that were bred and sold by Schreiner's have bloomed well and multiplied for decades in my garden in spite of my sometimes terrible gardening practices. I now have a gardener keeping weeds out, and I have had a large area of shrubs removed so that I now have a good sunny place away from roses for my irises. When my first order arrived last year, I was truly shocked by the size and quality of the rhizomes. I have ordered from many nurseries over my 67 years, and have never been as pleased. They are now starting to bloom and are so beautiful. 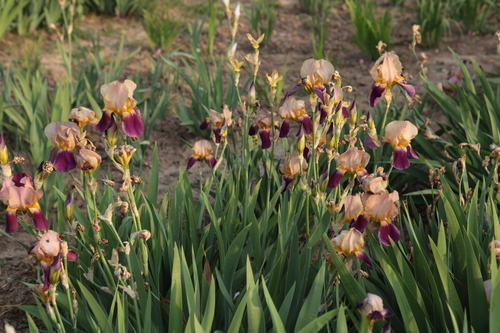 Bearded Iris gave us a wonderful charm of spring in Beijing. 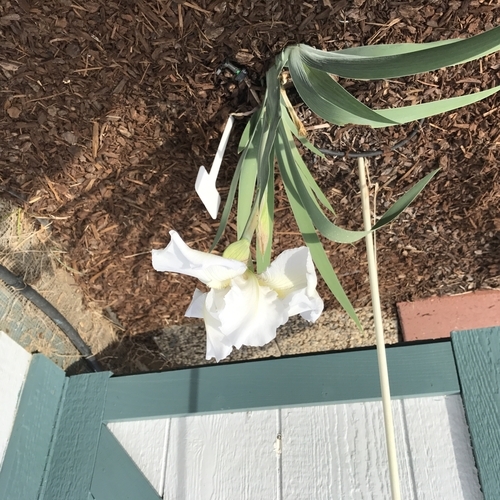 This year I came all the way from Georgia to see your iris bloom! I have ordered from you for years. You have iris that take by breath away when they bloom. I feel like I have jewels in my garden. They are so pretty, I've bought some for a friend in Mississippi. My son sends bouquets to his girlfriend's Mother, and I give gift certificates from you to friends. I truly love your flowers! I recently visited Paris and headed for the Jardin des Plantes (their botanical garden). 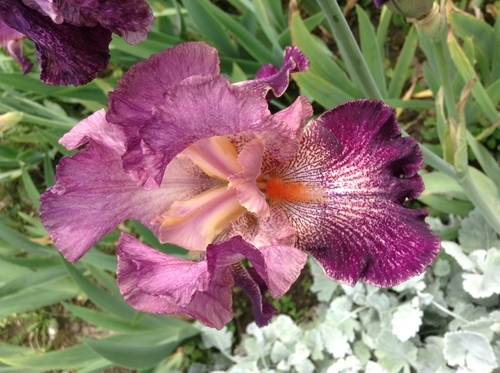 I was thrilled to find Schreiner's Iris heavily utilized in their Iris Garden section. 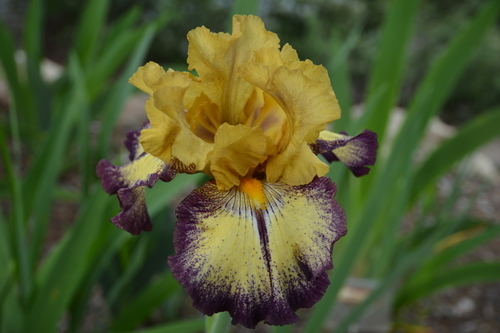 I spotted 7 different irises - Blue Suede Shoes, Titan's Glory and Starcrest still listed in the catalogue. Now appearing today was Carnival Time, Emperor's Delight, Last Chance and Cranberry Ice. 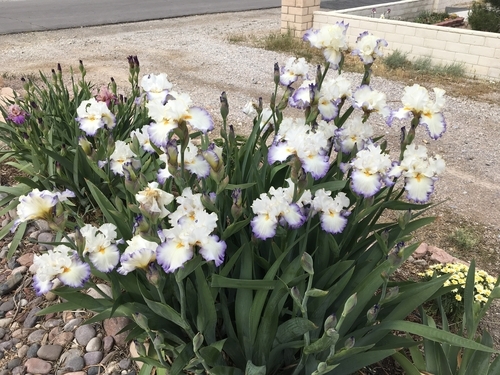 I have been a customer of Schreiner's for over a decade and grown their iris in Southern California as well as on the East Coast. It was great to see that clearly fans of iris have chosen an internationally well-respected source for our iris!!! Just got my Iris! I was a little worried because our temperatures have been in upper 90's with the heat index at over a 100! They looked wonderful! Just reordered at your summer sale, you are my go to for Iris! Thank you so much, I am glad I found you! The nine "reblooming" Iris that I purchased last year are absolutely fantastic. There have been Iris blooming in my front gardens since early May. There are two blooming right now and more bloom stalks rising. The plants are so vigorous and productive. One blooming now has one bloom stalk finished. Two more are blooming now and another rising. At least 4 bloom stalks the first year. Amazing. It is a great joy to look out this summer and see at least one, often more spectacular Iris. WOW I am really impressed! I have bought from other Iris vendors and I just received my first shipment from Schreiner's. The packaging and shipping are exceptional! I was really impressed at how careful and professional it all is. There is, in fact, accountability in that there are actual peoples' names of who pulled it, who packed it, with every item marked off and a certification of it. Every rhizome is BIG and healthy and I love that the labels even have photos so you remember what you ordered! It is so nice to include the informational booklet! It all arrived in a timely fashion ... and overall... just WOW! Great job! I received my order last week and wanted to let you know how pleased I was. The iris were packed so carefully and I appreciate the attention you give to making sure the iris arrived undamaged and in great condition. And you tagged each iris with all the important information, which I greatly appreciated. I am sure you will be hearing from me again. Thank you so much and I am so excited to see them bloom in the spring. Let the iris adventure begin! I just opened the box of our order and was stunned at the size of the rhizomes, the attention to detail of labeling each one and the size and apparent quality of each plant. Thank you so much! I just received my first order from you yesterday. I looked at the plants and want to say how nice they are! I was so excited to see the new growths on each of them. Now to plant and wait for the miracle of beautiful flowers to bloom in my gardens. The Gardens of TreeTopp. In Hattiesburg, Ms. I ordered my Irises this summer knowing they would arrive for October planting - and I ordered all rebloomers because the area I am putting them is one that we can enjoy spring and fall in our North Carolina home. What I didn't expect was that some of them would bloom THIS fall. The Midsummer NIght's dream has already produced two blooms and there are buds on two others - they are stunning and I couldn't be more pleased. Can't wait for this spring. This year I ordered several Iris to arrive after August 3, which they did. One of them got off to a very bad start, we thought it had died. This morning it is in bloom and I am so happy. The others are all doing good and a few, the re-bloomers, are trying to bloom prior to our first frost. Attached is a picture of "Immortality". This year I ordered several Iris to arrive after August3 which they did. One of them got off to a very bad start, we thought it had died. This morning it is is bloom and I am so happy. The others are all doing good and a few, the re-bloomers, are try to bloom prior to our first frost. Attached, I hope is a picture of "Immortality". 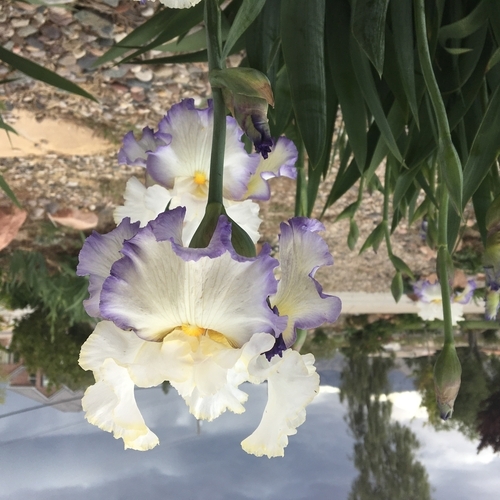 Always impressed by the beautiful gardens at Schreiner's Iris and the quality of iris rhizomes I have purchased since the early nineties. We have been able to transform our former weeds and rockoutcrop landscape into a terraced garden of beautiful iris, benches, paths, and even a hammock, thanks to the years of inspiration from Schreiners! This morning, Jan 11, 2017, with our area receiving almost 2 ft of very damp snow since just before Christmas; roofs collapsing everywhere, rivers flooding, side streets clogged with slushy snow & ice; your advertisement, your catalog was a ray of sunshine, a promise that spring will come. Thank you sincerely! I grew up in the Midwest and my parents always loved the Iris they had in their garden. I have always been drawn to their beauty. Since moving to Texas I was concerned about the heat. After doing my homework, I prepared my flowerbed and planted the varieties I bought. My neighbor shared with me that she noted them in my garden and is awaiting the spring bloom. Thank you for all the information you provide the first time growers. They came in great shape. The anticipation is like Christmas with the present being their beauty to come. Looking forward to expanding my collection. I ordered bulbs from Schreiner's and Brecks in same seasaon and even before I planted them I knew which ones were better quality. 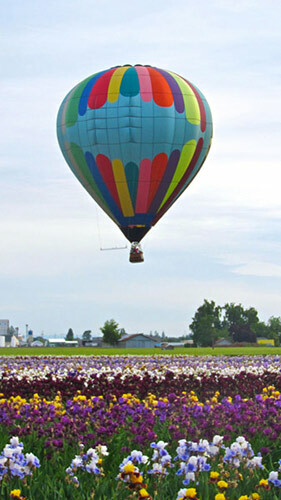 Schreiner's bulbs were huge, plump and healthy. 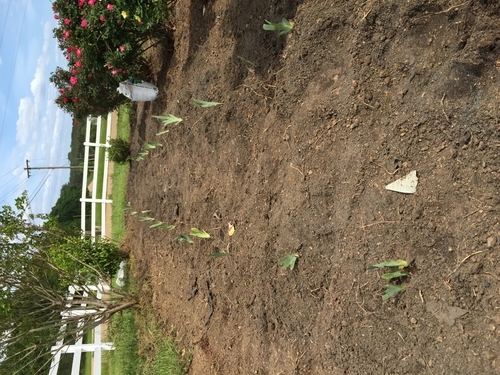 I planted all the irises (probably 30 in total). All of Schreiner's bloomed beautifully. Only 1 of the competitor (of 12) bloomed. The failed bulbs were guaranteed so they were replaced, but the replacements were as sad looking as the first batch. I will never buy irises from any place except Schreiner's. For over forty years I have enjoyed the products I have purchased from Schreiner's. If possible go to the gardens around Mother's day and view the magic and love that goes into the amazing plants you see. Next year watch the magic in your own garden. Iris from Schreiner's are healthy and grow wonderfully first year boom every time. This gets an A+ in my book, easily one of the best ever iris for size, number and vigor. Love it. I cannot begin to tell you how much joy your irises have brought. They are spectacular and I find myself checking every morning to see if any new blooms have opened. 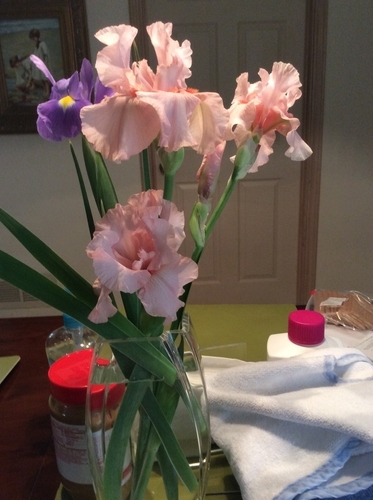 I have sent pics of stunning irises to my mum in Scotland so that she, too, can marvel. Although I am moving house shortly and will be leaving all my irises behind, I look forward to ordering LOTS more for my new home. 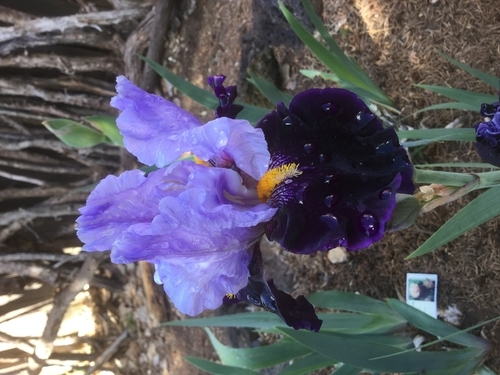 I planted last Fall in Santa Fe, mulched with pine needles, and now have the first bloom. The dew is from this morning's melted snow! This Iris's name is "Habit". Thank you Schreiner's! 98% of this iris bed is from Schreiner's! The other 2% was from family and friends. I always receive huge rhizomes! I tell anyone who wants iris to order from you.